Reccy trip. Inverchapel burn and Little Lochain,Beinn Ruadh. I’ve been out and about recently,mostly repeating previous reported routes. However, after a message from Malcolm of Scotland Hikers Group, I decided to head for the hills. He’s planning a trip taking in Inverchapel Burn,passing over Beinn Ruadh to head for the Lochain situated high amongst the rocky summits. There are no paths, however there are various deer/sheep tracks that can help with some navigation. First trip was the access the open hill via Inverchapel burn. Natural woodland and side slopes pretty much sum up the terrain of the river section,prior to the climb onto the open hillside. I returned via the route I did in the winter time. 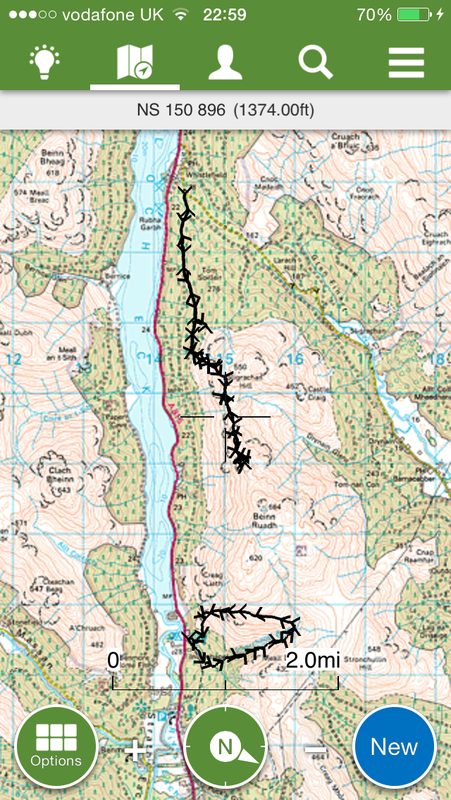 Route confirmed the continuation to the summit on the day would be straight forward. Second reccy trip was to establish a route off the hill from the Lochain,to join the forestry rd for the the return to Inverchapel. My ascent route was the same as descent route,have only included the pics for the return section as hopefully that’ll be the direction final the walk will be carried out in. The weather wasn’t ideal for navigation,but the track through the hills seemed ok. A steep descent with wet slippery grass prior to entering the forest was the hardest part. Some pics of todays reccy……..